Leading in the current environment can be both rewarding and challenging. Leadership development and coaching provide vital input to key teams and individuals ensuring your organisation has the capacity to deliver sustainable results. We offer both individual and team programmes to meet your requirements. Evolutionary connections can provide diagnostics and feedback to identify strengths to build on and establish opportunities for development. Our coaching supports you to hone your objectives, widen your view and understanding and develop particular skills and capabilities. We offer tailor made support to meet your unique requirements. Whilst knowledgeable about national policy and standards, Evolutionary Connections also recognises the unique needs and opportunities present in different organisations, systems and places. There are "must dos" but "how tos" are often best determined close to the people and communities delivering and receiving your services. 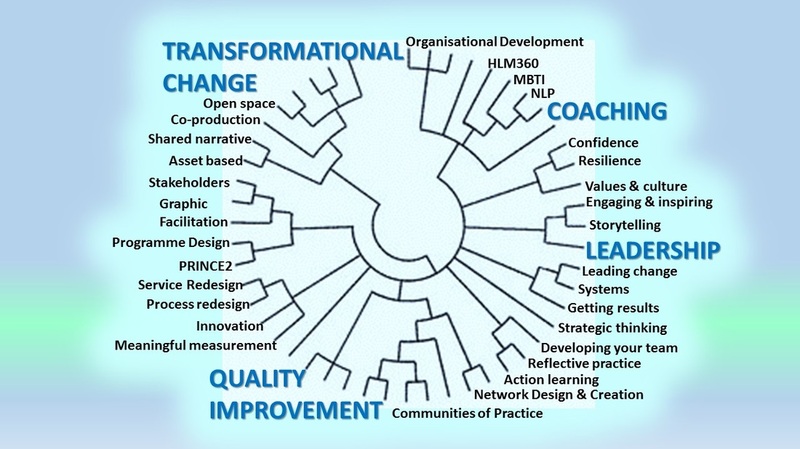 Evolutionary Connections is expert at using inclusive techniques to engage staff and stakeholders in the co-production of change and improvement work. Our flexible approach to programme design provides robust project management that is relevant and meaningful to your organisation.